After spending ten days in Gros Morne National Park in the Newfoundland and Labrador province of Canada, the Estski team has collected a lot of information about this area, in case you feel like going there too. It is just a little bit colder than in Montreal during the winter. There are numerous freeze-thaw cycles due to it's proximity from the ocean. For our stay in early March, the temperatures were between -10°C and 10°C (14°F and 50°F). On the precipitation side, snowstorms with accumulations exceeding 20 cm (8 in) are commonplace. The annual snowfall on the coast is around 5 meters (16.5 ft), but it increases rapidly with altitude and distance from the coast, reaching up to 10 meters (33 ft) on the heights of the Long Range Mountains. During our stay, we observed, for example, a large disparity in the snowpack from Rocky Harbor (on the coast) where it was non-existent to Wiltondale where there was a meter (3.3 ft) of snow on the ground, 40 km (25 miles) inland. High winds and whiteouts are a major climate problem up there. You will have to adapt your planning in consequence. The prevailing winds are from the southwest and it regularly blows over 80 km/h (50 mi/h). • By plane: $CA 500 - $CA 600 round trip ticket from Montreal to Deer Lake. • By road: the ferry costs $CA 220 for a round trip for a car and then $CA 84 per passenger. • Car Rental: $CA 550 at Deer Lake Airport for 10 days. • Accommodations: $CA 20 - $CA 50 per night in shelters, youth hostels in Rocky Harbor, Norris Point and Sally's Cove. • Restaurants: $CA 15 - $CA 40. We were tempted by the legendary Jungle Jim and Marie Brown restaurants. • Grocery: Same prices as in Quebec. Deer Lake will be the closest supply point. • Beer: twice as expensive as in Quebec. So, about the same price as in other Canadian provinces and more expensive than it the USA (but hey at least it's beer not water). We did it with a total budget of $CA 1300 per person, but we could have reduced it to $CA 1100 by setting some comfort aside. 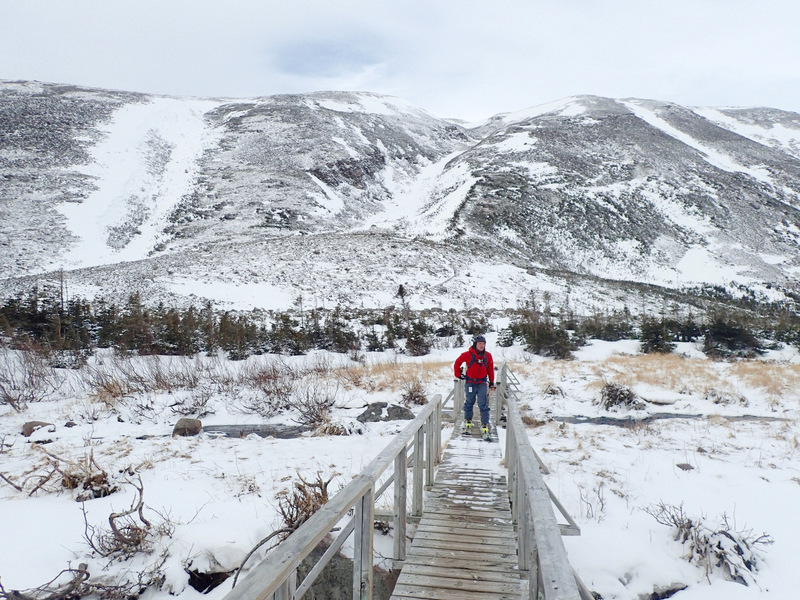 Gros Morne Park is not a very busy place in the winter: some Nordic skiers, snowmobilers, snowshoers, guys who practice ice climbing and some backcountry skiers like us. 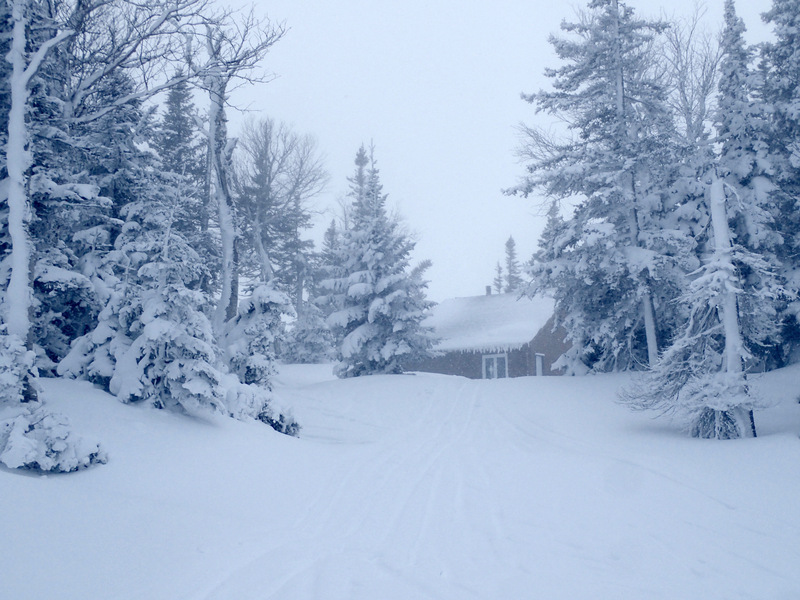 In 10 days, we only met snowmobilers in authorized locations and four Nordic skiers. There is a lot of skiable terrain inside the park, but also outside. However, you have take into account snowmobilers who enjoy the steeper skiable terrain as well. Gros-Morne, Killdevil, Big Hill and Rocky Barachois are the preferred mountains for skiers as snowmobiling is prohibited. A map at the bottom of the article will help you to locate the different areas we talk about. There is no avalanche bulletin available for the region. Note that the places presented in this guide are mainly located in avalanche terrain. Probe, beacon, shovel and knowledge is mandatory. There is a potential project to provide avalanche bulletin in the upcoming years, in collaboration with Avalanche Québec. In the meanwhile, and as you always should, be prepared to make your own assessments. Near the road we found three beautiful corridors, very wide and with 600 meters (2000 ft) of vertical drop on Killdevil and Big Hill. The slopes are southwest facing and are relatively constant around 30°. The prevailing wind often blows in. We went when the slope was sheer ice. We climbed crampons and ice axes directly into the corridors, which seemed pretty stable to us that day. We do not recommend it if you have doubts about the stability of the snowpack. Access is also possible through the bush on the shoulder. 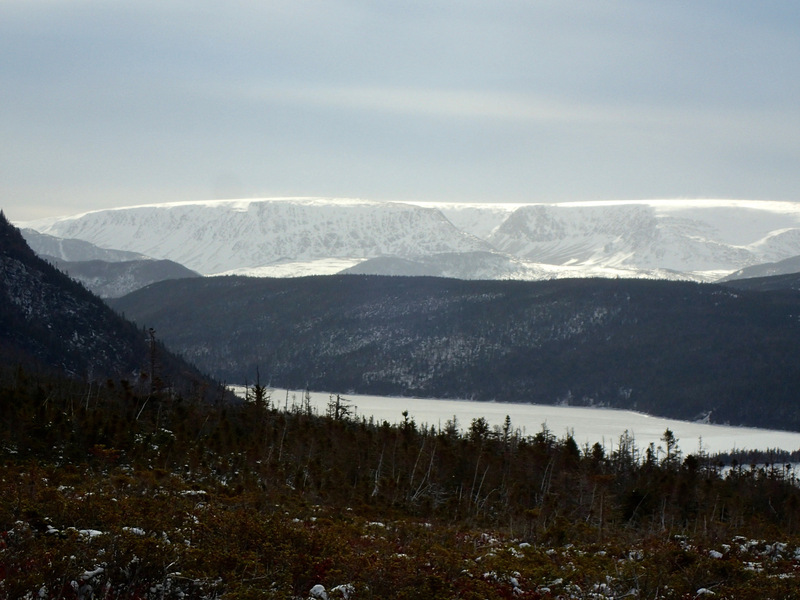 The not to be missed Gros-Morne has beautiful lines from 200 to 400 meters (650 to 1300 ft) vertical. The approach to get to the valley is 4 km (2.5 miles) long with 320 meters (1050 ft) of vertical. Depending on the conditions, you can then go around the mountain or climb directly in the south-west face. 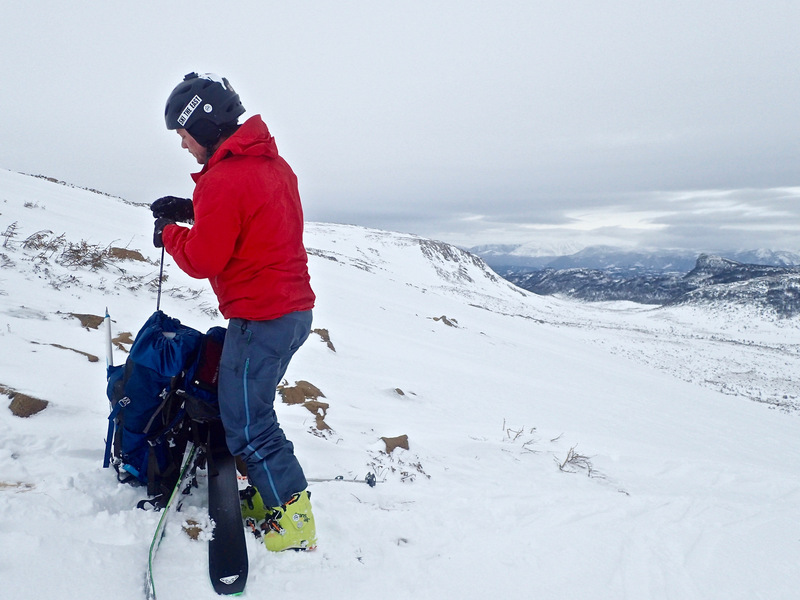 We did not explore much, but we climbed the southwestern face that was bullet proof once again, and went skiing on the southeast face to find a nice bowl and some nice snow. The slopes vary from 25° to almost 40° near the summit. Once again, watch out for avalanches. This bowl is extremely famous for spring skiing because it is loaded with snow by the prevailing wind throughout the winter. 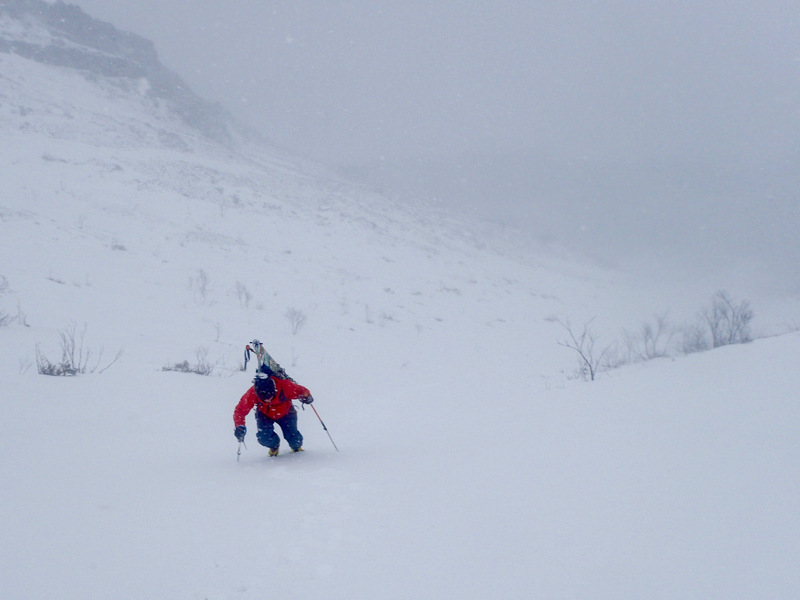 In the middle of winter, it's pretty dangerous: 5 cm (2 in) of precipitation that can turn into 1 m (3.3 ft) of wind slab with scary big cornices. The bowl is very easy to access from the road. We skied a total of 400 meters (1300 ft) vertical. The first half was on beautiful snow, on the shoulder and at the bottom of the bowl. The remaining was ice, the common theme of our trip. There are other lines steeper than one another, but they are often short in vertical. The greatest diversity of terrain we found was in Southwest Gulch on the edge of Tablelands: steep slopes, open forests, bowls, low angle slopes and also lines with bigger vertical in the order of 400 meters (1300 ft). The vertical is in general more around 150 m-250 m (500-800 ft). Unfortunately, weather conditions were extreme over our two days stay (read: WIND), so we had little time to enjoy this area. 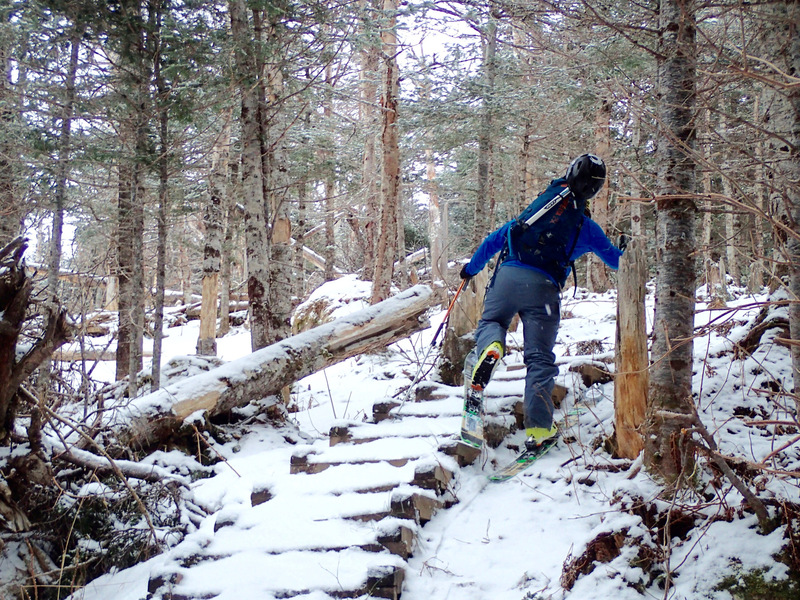 The open forests around the refuge allowed us to ski in beautiful conditions. With acceptable weather, the possibilities are incredible around the refuge. The skier icon represent the areas that we have skied. Click on the icon at the top left to access the names of places. You will also find photos from the field.